Chile is currently experiencing convulsed political days given the heated debate over the parliamentary ratification of the Trans-Pacific Partnership, known as TPP11. This treaty was signed by the 11 member countries in March 2017, pushed by the government of Michelle Bachelet. Since the signing of TPP11, a battle began in Chile which has recently reached its peak. After the Executive Power presented it to be discussed in the plenary session of Representatives in March, the project was forwarded to be rediscussed in three commissions: Agriculture, Labor and Constitutional issues; in the first two the project was rejected. This has shown that TPP11 does not have a political consensus in Chile today. The forces of the biggest Chilean parties, prone to free trade, are divided on the project, and it has already received its total rejection by the parties of the left and progressive parties. The discussion of the last 2 months has been filled by shameful acts by members of the Chilean Foreign Ministry, who were cornered by criticism. The official position of the Director of International Economic Negotiations (DIRECON) states that the current questioning of the TPP11 is based on "doubts and ignorance" of the treaty, thus removing the strength of the many arguments that the social movement has been producing for years. On the other hand, the officials of this office were repeatedly cornered by representatives of civil society in the congressional committees. Recently, in the Work Commission, DIRECON Director, Rodrigo Yáñez, had to recognize that the Labor Affairs chapter only refers to minimum labor standards according to the International Labor Organization (ILO) and that it does not really obligate states to respect their own labor laws. The corralling has made itself felt on the government, forcing it to redouble the media campaign in favor of the TPP11. Recently, several representatives of the Chilean right have been forced to give their public support to the treaty, such as former President Eduardo Frei, who argued that TPP11 should be approved this year, as Chile is organizing the APEC Summit in November. 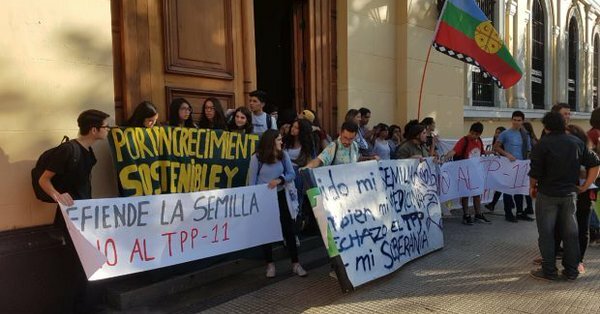 The Chilean Pacific Foundation, a pressure group of big businessmen such as the Luksic Group, also argued in its defense that the rejection of TPP11 is due to "misinformation and empty content slogans". These facts are unprecedented in Chile, a country whose last governments have sustained a general agreement on the supposed benefits of the FTAs, making Chile the country with the largest number of treaties in force. But TPP11 is the worst of all signed FTAs. Since the treaty began to be negotiated in 2012, originally with the US, the regional social movement ignited the warning alarms. The platforms and convergences "Better without TPP" were quickly established in Mexico, Peru and Chile, with the focus on the need to share action strategies. The analysis was univocal: the TPP is a Free Trade Agreement (FTA) that brings in its 30 chapters the most advanced topics of privatization and deregulation, impacting directly on access to seeds, medicines, basic services and even Personal information. Therefore, the TPP had to be stopped; for this, the political subject that opposed the treaty in each country should be built. The work of weaving networks and contacts by the Chilean Platform “better without FTAs” finally gave rise to the constitution of a great front "No to TPP11" made up of environmental movements, trade unions, political parties, feminist organizations, among others, that linked their topics of daily work with the TPP11. The fight that is taking place today in Chile is little known outside the national territory. But without a doubt it is the most relevant fight against the FTAs in recent years. And the TPP11 is not just another treaty: it is the worst Free Trade Agreement in history, because it is the one that most crystallizes corporate privileges and foreign investors rights, restricting the rights of peoples to have a decent life. What happens in Chile will have a cascading effect throughout the region, in a context where presidents accept liberalization as the only possible plan, and new negotiations multiply, especially in the face of Pacific countries. Today, the regional and global organizations and networks that are fighting against the FTAs must openly support and demonstrate our solidarity with the Chilean social movement. The way in which this political battle ends will have a high impact on the path of liberalization in the rest of the countries of our region. Luciana Ghiotto is the regional coordinator of the Platform “Latin America better off without FTAs”; member of ATTAC Argentina and collaborator of Transnational Institute (TNI).